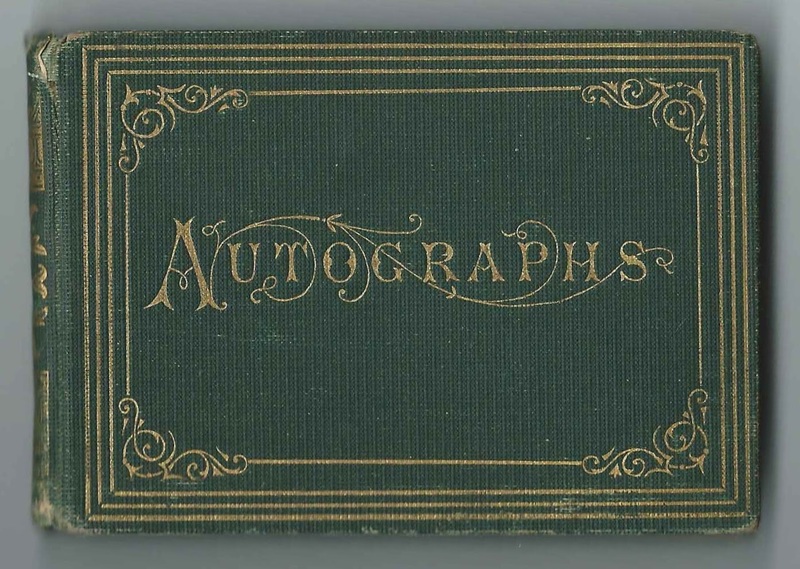 1874-1875 autograph album that belonged to William Adams Sanborn, "Willie", a Charlestown, Massachusetts, native, who was then living at Brooklyn, New York. Willie was the son of Daniel Alfred Sanborn [sometimes seen as Daniel Alford Sanborn] a map maker who founded the Sanborn National Insurance Diagram Bureau, which produced the "Sanborn Maps", now of great help to historians and genealogists. Daniel, a native of Somerville, Massachusetts, had New Hampshire roots, which presumably explains the inscriptions by New Hampshire residents. 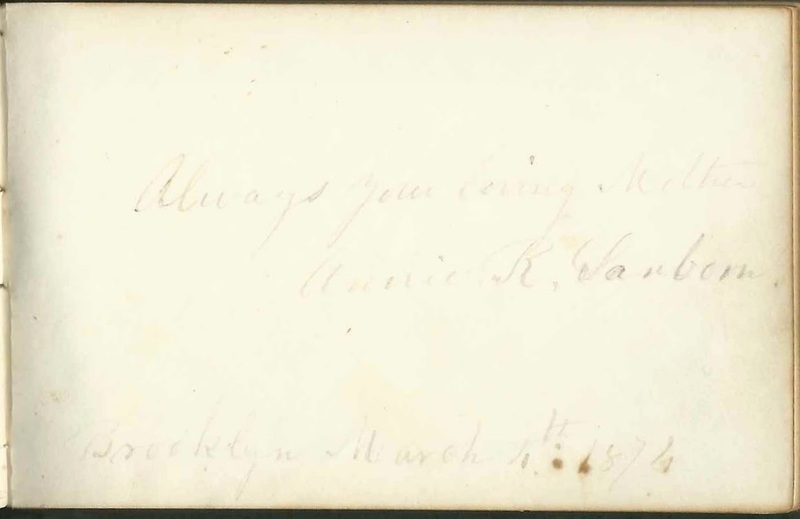 The album measures approximately 4-1/4" by 2-3/4" and contains the sentiments of 12 of Willie's relatives and friends. An alphabetical list of the inscribers, together with any personal information they offered, appears at the end of this post. William Adams Sanborn, "Willie", was born September 4, 1864 at Charlestown, Massachusetts, the son of Daniel Alfred Sanborn and Annie Rogers (Foster) Sanborn. 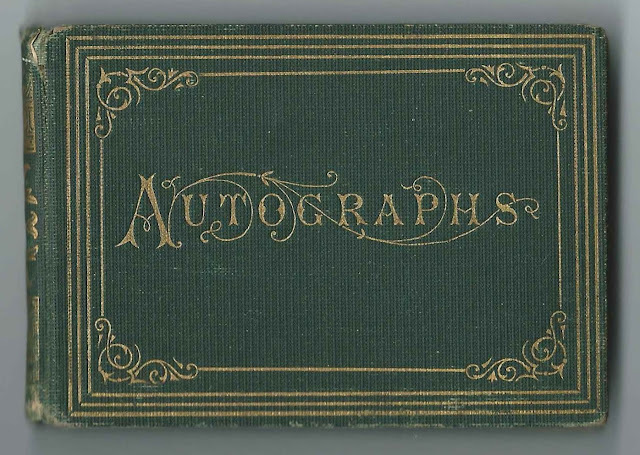 Both parents inscribed a page in Willie's album. 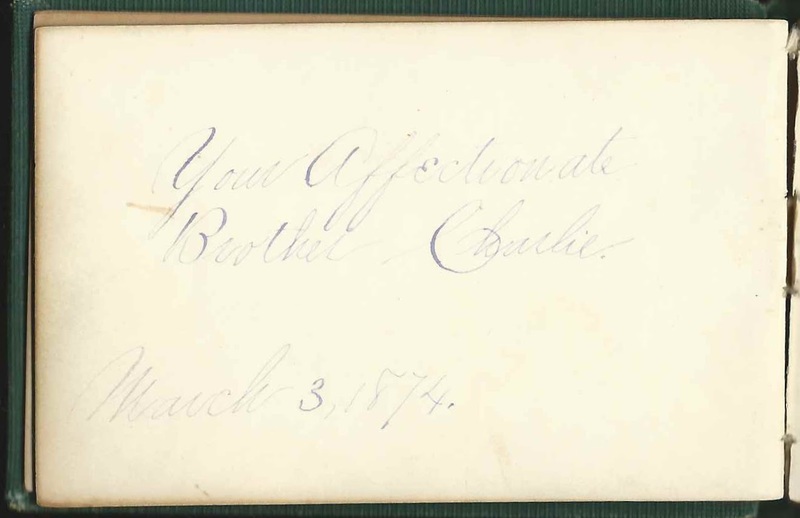 Daniel noted on his inscription that he was writing on the day that Massachusetts Senator Charles Sumner died. Willie's brother Charles F. Sanborn, "Charlie", also inscribed a page. 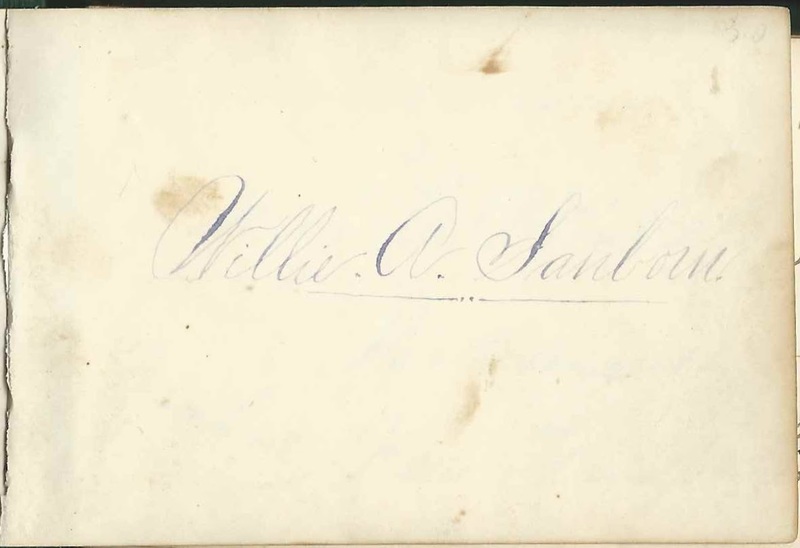 About 1885 William Adams Sanborn, "Willie", married Nellie Aurelia Smiley. They lived at Hartford, Connecticut, and had at least one child, daughter Eleanor. William and Nellie died in 1930 and are buried in the Cedar Hill Cemetery at Hartford, Connecticut. Eleanor married William Walter Wilcox, perhaps a descendant or relative of the Stephen Wilcox who inscribed a page in the album. Ellis Lea; inscribed on March 7, 1874. Lea might have been the abbreviated form of a surname, as there's a period after it. Annie R. Sanborn; inscribed at Brooklyn, New York, on March 4, 1874. "Your loving Mother". Annie Rogers (Foster) Sanborn, Willie's mother. 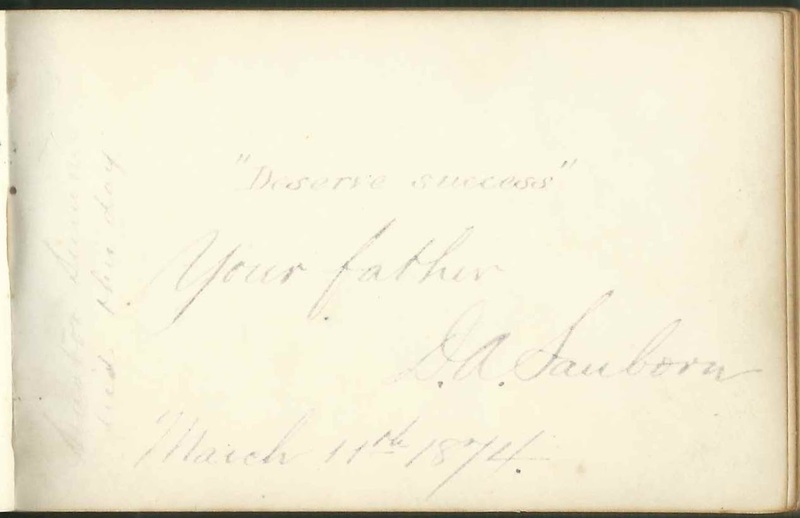 D. A. Sanborn; inscribed on March 11, 1874. "Your father". "Senator Sumner died this day". [Massachusetts Sen. Charles Sumner (1811-1874)]. D. A. Sanborn was Daniel Alfred Sanborn, Willie's father. A Somerville, Massachusetts native, he founded the D. A. Sanborn National Insurance Diagram Bureau - the "Sanborn maps"
Eddie Tennyson of Brooklyn, New York; inscribed on March 10, 1874. "Your little friend"